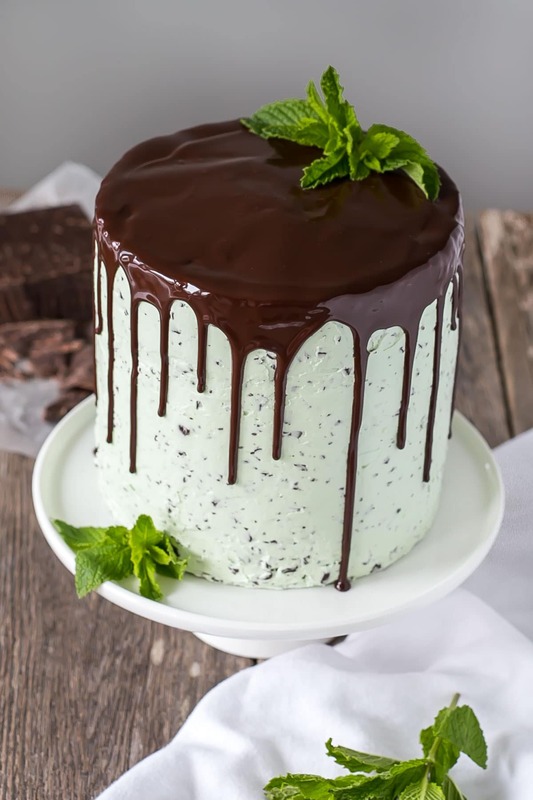 This Mint Chocolate Chip Cake is a mint lover’s dream! 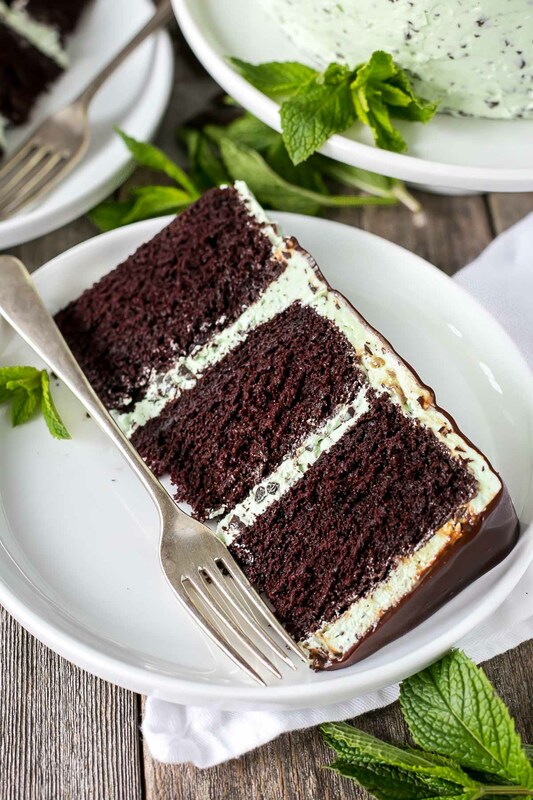 Layers of decadent chocolate cake topped with a silky mint chip buttercream. Did you know that there is only one Olive Garden restaurant in Vancouver? It’s not really even in Vancouver, it’s in a suburb called Langley about 40+ mins outside of the city. Further research tells me there is actually only ONE Olive Garden in all of BC. Meanwhile, just south of the border it seems like there’s one every few blocks. The one location we do have is about 20 mins from where we live, and always has at least a 1 hour wait. With such high demand, you think they’d expand to more locations?! So, I think I’ve only been to Olive Garden two or three times in my entire life. Sad, right?? One of these times was actually just a few weeks ago, when Ryan and I spontaneously decided to go there for a late dinner. Very out of character for us — both the spontaneous Olive Garden trip and the late dinner. The wait was only 45 mins this time. It was worth it though — we got a great table and the food was delicious. Those breadsticks and dipping sauces (five cheese marinara, omg yum) and I finally got to try the infamous Zuppa Toscana. Maybe only infamous to me though. As a food blogger I see that recipe everywhere. Now I see why. I could happily have had free refills of that as my dinner and been content. Well, that and the breadsticks. 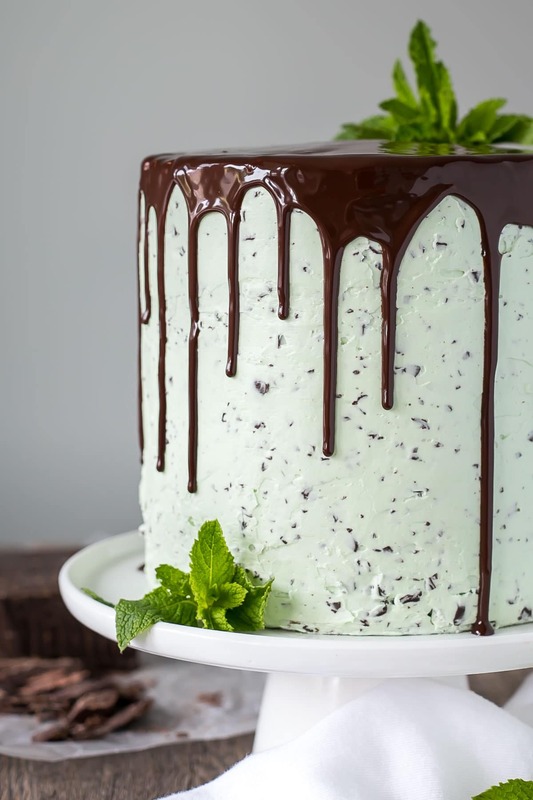 Anyhow, you’re probably wondering where I’m going with this, and what on earth it has to do with this Mint Chocolate Chip Cake. Well, I had forgotten that at the end of the meal they give you these Andes Chocolate Mints and omg they are GOOD. I love the combo of mint and chocolate (hello After Eights ♥), but these mints are honestly the best. The BEST. Someone tell me where I can get these in Canada! I was hoping I’d find a giant tub of them in Costco, but no luck. I need these in my life, and my once-in-a-blue-moon trips to the Olive Garden aren’t going to cut it. 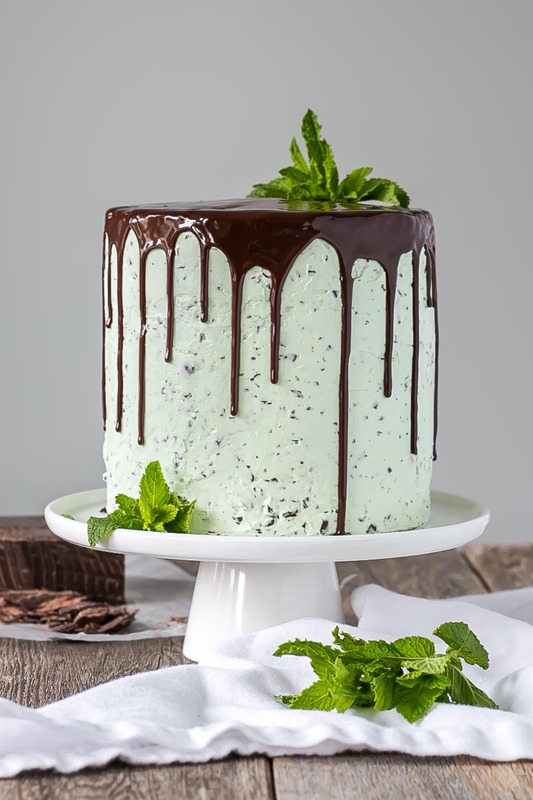 So, inspired by the delicious Andes Chocolate Mints, and in an attempt to recreate this flavour and try to satisfy my craving, I bring you this Mint Chocolate Chip Cake! For the cake layers, I used my favourite chocolate cake recipe. It truly is the best if you like a rich, chocolatey flavour. I debated putting mint extract into the actual cake batter, but I stuck with vanilla. I wanted the frosting to contrast with the cake, and didn’t want the mint flavour to be too overpowering. The frosting is a classic Swiss meringue buttercream but with mint extract instead of vanilla, some green color gel, and chopped chocolate added in. I recommend using good quality chocolate for the chips and the ganache. It really makes a difference! I use Callebaut, but you can use any good quality chocolate that’s available to you. If you’re limited to a grocery store, Lindt is your best bet. To me, this cake tastes just like those delicious Andes Chocolate Mints, but in cake form. A worthy substitute until I can get my hands on some. 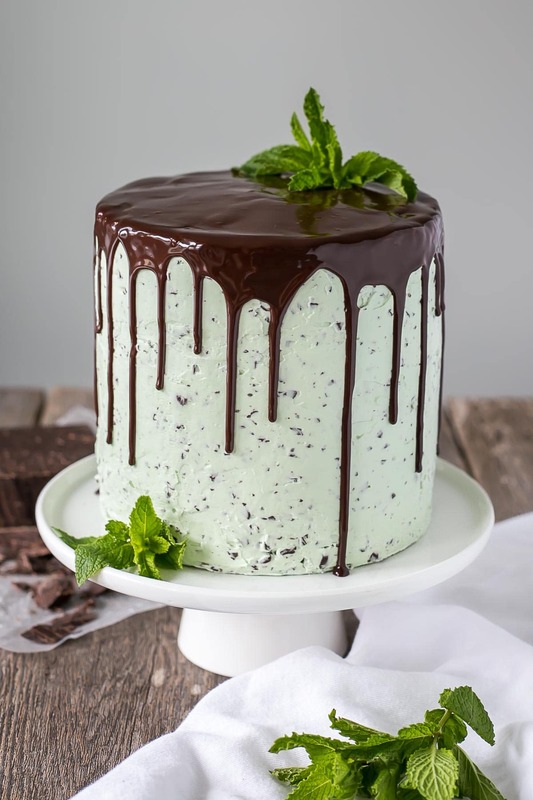 If you love mint chocolate candy, ice cream, or any other form, you will love this cake! Use good quality chocolate if you can. I use Callebaut, but Lindt will do if it’s easily available to you. I used Kelly Green color gel to color the frosting. For the ganache, I let mine set overnight (with plastic wrap placed directly on the surface). It will be too thick at this point, so I microwave it for 5-10 secs and stir it until it’s the right consistency. Place bowl on your stand mixer and whisk on med-high until the meringue is stiff and cooled (the bowl is no longer warm to the touch -- approx. 5-10mins). Switch to paddle attachment. Slowly add cubed butter and mix until smooth. Add peppermint extract. Stop the mixer. Dip a toothpick into the green color gel then dip it into the frosting. Whip until smooth and evenly green. Add more color gel if desired. Place chopped chocolate and cream into a microwave safe bowl. Stir to combine. Microwave for 20 seconds, stir. Microwave in 10 second intervals, stirring in between, until ganache is smooth and silky. Set aside to cool completely and thicken slightly before using on cake. See notes. Place one layer of cake on a cake stand or serving dish. Top with about 2/3 cup buttercream. Repeat with remaining layers. Frost and smooth the outside with a thin crumb coat. Chill for 20mins. Top with fresh mint if desired. For the ganache, I let mine set overnight (with plastic wrap placed directly on the surface). It will be too thick at this point, so I microwave it for 5-10 secs and stir it until it's the right consistency. Hi Jen! So glad you love it, thanks for the feedback! Made this for my friends birthday dinner last night. I always love trying new cakes with this crowd and with 12 birthdays between the adults and children I’m never without a chance to bake another cake. I’ve lusted after trying a cake from your site for a while and last night this cake did not fail my hopeful expectations. I used regular mini chips inside since my toddler was sleeping and I didn’t want to chop up larger blocks of chocolate. While this worked, it didn’t give the full ‘mint CHIP’ experience. I’ll have to do it up again. ;D Mint to chocolate ratio was great! EVERYONE loved the cake. Thanks again. Hi Olivia, I made this cake for my sister’s birthday, and it was amazingt! The chocolate cake was wasn’t too sweet, and the mint buttercream was the perfect balance of sweetness and mint. It was my first time doing a drip ganache, so it was a bit uneven, but nothing extra buttercream and Sweetapolita sprinkles cound’t fix! Lol. I’ve made a few of your cakes, and they have all been fantastic. Thank you! Looking forward to making this cake for St Patrick’s Day get together. I do have a question about the darling chocolate. Is it bittersweet or semi-sweet or maybe what percentage of cocoa in the chocolate. Thanks so much. Hi Kay! Mine is more on the semi-sweet side, but bittersweet will work too! It doesn’t say the percentage, but I’d guess about 65% or so. When bringing this to a party, can you leave it out on a table or should it be kept in the refrigerator? Curious because of the egg whites in the frosting and cream in the ganache. Thanks! Hi there! It can be left out no problem for a few hours. Hi, Olivia! Do you think I can replace the chopped chocolate in the buttercream with crushed Oreos instead? Hi Lorna! Yes, it’s 1:1 by weight for both for dark. White and milk chocolate is 2:1 chocolate to cream. I made this cake for my mom’s birthday this year (also Christmas). She is obsessed with anything mint chocolate. I remember when I was a kid she used to talk about withdrawals from York Peppermint Paddies (to this day she believes they add something addictive.) It was amazing! HUGE hit. The chocolate cake is so moist and rich, and the buttercream frosting is smooth and buttery with the perfect amount of minty-ness! She has been talking about it all week, saying it is the best cake she has ever eaten! We only had 9-inch cake pans, so instead of 3 6″x2″ layers, I did 4 9″x1.5″ layers. Using the conversion table linked in the comments, this meant multiplying the recipe by three. Of course that meant nothing fit in my mixer, so I did it in two batches. We used an entire box of the dutch cocoa powder and 3 bars of Ghirardelli because of the tripling of the recipe (no complaints here!) but we were actually short on chocolate for the buttercream and added a bit of semi-sweet chocolate chips. Also, we only had food coloring liquid. We had to use a couple drops instead of the toothpick dip. It was still amazing and looked just like the picture! Overall, amazing recipe that will now be a holiday tradition! Thank you! 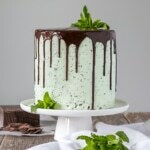 When my 3-year-old son asked for “Mint Chocolate Chips” cake for his birthday, my research began and I came across this recipe. I needed to try this recipe. My cake came out just like the photo, which I was very pleased. I love the frosting. The mint isn’t too overpowering yet not too subtle. The only thing is I felt the frosting was a bit too much- the somewhat thick layer of frosting made the cake too rich and we ended up not being able to eat all the frosting used in the cake. If I make this cake again, I would make it as a naked cake and drizzle the chocolate ganache. I think that would be perfect. I need to do this recipe in one 13×9″ pan. It’s ok if I double the quantities for the chocolate cake ? Or I have to triple them ? I will try to do a 3D LION 🦁 cake, and I need the layers not to be very thin. 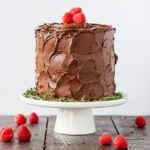 Hi, will it be ok if I prepare the mint buttercream the day before as well? Hi Jessie! Yes, this will be fine. I would refrigerate (not critical if only 1 day) then bring to room temp and rewhip before using. Hi Monique! Mine are all 2″ deep and the cakes rise right to the top. I’ve never used a spring form, but imagine it would work ok. Let me know how it turns out! Party City here in St. John’s, Newfoundland, has the Andes Chocolate Mints. They are sold individually in large bins by the cash register. I cannot get them anywhere else. Hope you have a Party City close to you and can find them on your end of the country. I’m going to make your cake this weekend for my family. Hi Noreen! Thanks for the tip!! We do have Party City here so I will check that out. I hope you like the cake! Let me know if you find the Andes Mints. Good luck !!! I made this cake for my moms birthday this week and it was BETTER than my favourite salted caramel cake (from Oprah’s website) which is the highest compliment I could give. 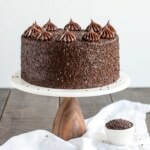 I wasn’t sure about so many things while making it, would I like the chocolate in the icing, should I use oil instead of my usual butter in the cake, does it need ganache? It was perfect, I’m so glad I trusted you and I can’t wait to buy some freeze dried fruit for your other recipes! Hi Jen! Wow that is high praise indeed! I am so happy to hear that it was better than you expected!! I was really excited about making this recipe but the icing was super runny. I even tried to make the icing twice! The meringue was definitely stiff when I stopped whipping it and I even made sure the butter was a bit colder the second time around. It seemed like the meringue wasn’t even phased when I added the butter in. Any advice? Hi Kerri! It sounds like maybe the meringue was still too warm when you added the butter, which can make it soupy. Next time, try sticking the whole bowl into the fridge for 20mins and then rewhipping. Repeat until it comes together (it should!). Hi! I just tried this cake today. My buttercream was extremely runny as well unfortunately. I believe it may be the ratios. Next time I’ll try the 1-2-3 method which always works for me. 1/2 c whites, 1 c sugar, and 1 1/2 c butter. Thank you! Great flavor. Beautiful cake. A Swiss meringue becomes runny for one of two reasons: meringue is too warm when butter is added, or the butter is too soft. Either way, it’s saveable with some time in the fridge. Glad you liked the flavour! Do you think I could bake one chocolate cake at a time and leave the rest of the batter out or in the fridge? I have a really old oven that doesn’t bake very evenly and can’t handle more than one thing a time. Hi Patrycja! Ideally the cake layers should be baked right away. 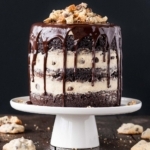 Hi, I want to make this cake for my boyfriends birthday but he can’t have cream…. could I do the gnash with out the cream and just chocolate ? Would that still work ? Hi Gemma! If you did it that way it would crack when you cut into it. I’ve heard you can do a ganache with water instead (though I’ve never tried it), so maybe take a look for that?? Can I divide this recipe between 2 nine inch pans? If so, how does the baking time change? Hi Michelle! I think the layers would be too thin in two 9″ pans. The recipe as is will work for two 8″ pans. If I were to double the ingredients, more or less how many cups of batter would I have and would it be enough for a 3 layer 8 inch cake? Your cakes always look divine! Thank you for this page… It really gives us very good recipes to try out! Hi Just making this cake & I am a complete novice with baking! How long will the cake keep for once made? I am making the cake 4 days before I need it so should I freeze it or not? Hi Emma! Ideally serve cakes the same day or the next. If you need to store it, freeze it and take it out for a few hours day of serving. I made this cake for a fundraiser benefit. I had trouble with the buttercream frosting. I couldn’t get it to become creamy. I followed the directions. As a was beating it the frosting became runny. I frosted the layers and chilled the rest overnight. Today I’ll frost the sides. It is really a bumpy frosting and I’m hoping it will look ok. Hope it tastes good. The cake batter was delicious! Hi Manuela! So happy to hear that you both liked it, and glad the GF flour blend worked well! This cake was amazing! I don’t have a 6″ pan so I did 2 – 7″ layers. We do not do artificial food coloring so we didn’t make it green. I used peppermint essential oil in one of the layers of cake as well as the icing and ganache. I will definitely make this again and I am not a baker – in fact this was my first try at a layer cake and with buttercream icing! It was a HUGE hit with everyone who tried it! Hi Erin! Yay! So happy to hear that everyone liked it 🙂 Thanks for your tips! 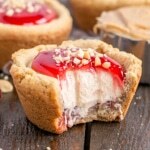 Could this recipe be halved in order to make just a few cupcakes? Hi there! You bet. You’ll just need to adjust the baking time for cupcakes. I’d start checking at 15-20mins. I made this cake for my boyfriend’s mothers birthday and even people who didn’t like mint chocolate went back for seconds. It was phenomenal! I couldn’t find much for mint chocolate, so we decorated with mint aero bubbles and they paired well with the cake. Everyone seems to want more of this, and I figured maybe I could turn it into cupcakes to share. Do you have any suggestions for modified baking times? Would you think putting 3/4 c white sugar and 3/4 c brown sugar instead of 1.5cups of white sugar will help make the cake fudgy? Hi. I’m baking various deserts for an upciming event but due to timing and other things needing done I’m doing ahead of time and putting in the freezer. Can you freeze this icing and the ganache? 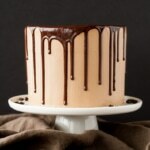 If icing can freeze, should the ganache be put on at the last minute? Let me know your thoughts. Thanks in advance for your help. Hi Lorraine! Yes, you can freeze the icing and ganache separately. The icing will need to be brought to room temperature and rewhipped. The ganache will need to be room temp and likely microwaved a bit to make sure it’s pourable (not warm though). You could also freeze the whole frosted cake (without the ganache). I hope that helps! 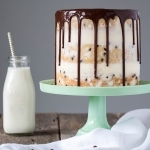 My husband loves mint chocolate chip – can’t wait to make this cake for his birthday! I want to thank you for this recipe!! I just made it for my sister-in-law’s office and they absolutely loved it! Your instructions were easy to follow and I enjoyed making it! Thank you again!! I really want to make this cake, but using larger tins. would I need to adjust the recipe to get 3 9 inch cakes? Hi Janine! You can double the recipe to do that. Ideally, you’d use three 8″ tins as the layers will be a bit smaller in the 9″. You may need to decrease the baking time for the 9″ pans too since they’ll be thinner. Thanks Olivia. Would there be enough butter cream for the larger cake or do I need to double it too. I usually find I have plenty of buttercream with some left over. I tend to use just enough buttercream in my recipes so there isn’t a ton left over, so I would definitely at least 1.5x but probably double to be safe. I LOVE this receipe and your website! Thank you for sharing your recipes for these beautiful cakes. Instead of using 3 x 6″ pans I used 2 x 9″ pans and it worked out great — I just needed to make more ganache. 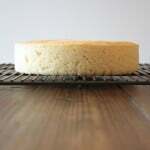 Your tips for baking flat-topped cakes were SO helpful – -the first time I’ve ever had flat cakes right out of the oven! I also like that you use buttermilk because I am baking at a higher altitude (in Colorado) so that helps tremendously and I didn’t have to adjust any of the ingredients. 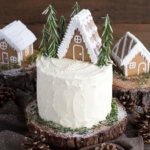 I did have a little trouble with the frosting not coming together the first time, but I found this post to be helpful and was able to rescue it: http://www.thebrewerandthebaker.com/archives/7640. Thanks again! This looks amazing! Will make for my sisters bday his weekend! Can I substitute 2 layers of and 8 or 9 ” do the three layers of 6″ and use the same measurements? Hi Kat! Sorry for the delayed reply. Two 8″ should work fine. The 9″ ones will have your layers come out too thin. I want to thank you so much for this frosting recipe!! I used a similar, but larger, cake recipe I had already creeated for 3 8 inch layers. I do use coffee in place of water as you mentioned for an option. The frosting was fantastic! So so good! I made the recipe just slightly larger for my bigger cake. I decided to use a blend of mostly peppermint extract and a litle spearmint oil. (I had noticed the mint extract at the store was a blend of spearmint and peppermint). The frosting came together without a hitch. It’s such a great consistency. I also increased the ganache to 3 oz of choc/cream for my bigger cake. The ganache was so easy! I’ve been baking cakes for over 30 years, but I only just came across your blog. Thank you so much! I made this for my stepson who loves the mint/chocolate combo, and the entire family party of eleven loved it! And it’s so beautiful! I’ll be checking out your other recipes! Also thank you for your tips for a flat-top cake- I’ll be using your tips for all of my cakes in the future. Hi Kristi! Thanks so much for your sweet comment! I am so glad that you (and everyone) liked this frosting 🙂 Thanks for your tips on modifications too!! Oh my goodness. This is amazing. I can’t wait to make this soon. Nope…gotta agree to disagree on this one. Not a chocolate/mint fan. Looks amazing though. May have to try it with everything but the mint extract!! It’s SOOOO pretty!! Those Andes Mints are amazing and I see them less and less now. I’m not even sure if they sell them in grocery stores. So I’ll just have to make this cake instead, which looks AMAZING! Noooo! Don’t tell me that :'( I need to find them somewhere. Maybe I can order online, haha. Hi Sandra! Either will work totally fine. The one I used said peppermint/mint. Esse bolo é maravilhoso e parece ser muito saboroso. Vou testar a receita com as crianças daqui. Tenho certeza que irão adorar! My most favorite candy ever! They are also made in my home state of Wisconsin! I can’t believe you can’t find them. I think Olive Garden has their candies made specially for them, the flavor might differ slightly from the retail ones. However, they are still delicious! They also have other flavors too. Toffee, cherry and peppermint crunch. Your cake is beautiful, as usual! Thank you Andrea! I had no idea about the other flavours 😮 I’ll be scouting these out on my next trip to the states! If you can’t find them, let me know! I would be happy to send you some! No one should have to go without these in their life! They also sell “baking chips”, which are bags of pre-chopped candies. Perfect for baking! My son & I are mint chocolate fans! This looks fantastic & I can’t wait to try it. I have found Andes mints at dollar stores (Dollartree and Dollarama) in small bags as they are a frequent cupcake garnish. Whoa, this cake looks absolutely gorgeous! I love mint and chocolate, definitely my favourite flavour combo!